Since the conquest of the upright position, the foot has gained more importance as an organ that supports both the lower limb and the whole body weight and that allows humans to stand up, walk, run, jump, and climb. Human evolution determined progressive changes in the skeletal architecture and the soft tissue of the foot to cope with new environmental requirements. From the orangutan to the chimpanzee, from the gorilla to the human, the most important modifications of the skeleton included the progressive reduction of the distal area of the phalanxes with the loss of the grasping function and the enlargement of the proximal bones (astragalus, calcaneum) to obtain a resistant yet flexible structure. See the image below. 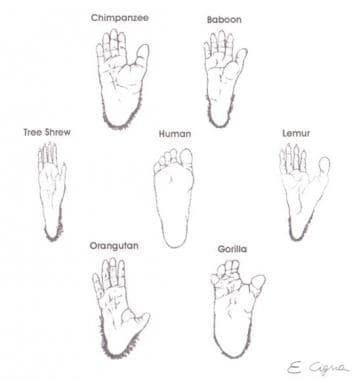 Different evolutions of the foot in primates. The overlying skin and soft tissue, particularly on the foot sole, also changed, acquiring nonshearing and padding properties that made the feet strong and able to support the weight of the body. The history of foot reconstruction began with an attempted morphologic restoration of the shape. The most ancient description is an Egyptian prosthesis found in a pharaoh's sarcophagus. The first written report on foot injuries is found in Roman war surgery books, in which amputation already is suggested as the elective treatment for serious foot damages. The introduction of antisepsis and analgesia and the anatomic studies of the foot improved surgical treatment. Foot surgery began to be more accurate and sophisticated, as surgeons sought a proper functional reconstruction rather than a pure morphologic restoration of the shape. 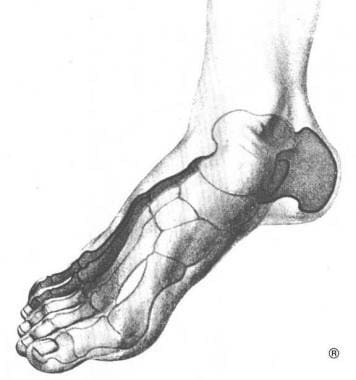 Snyder, in 1965, and Kaplan, in 1969, also highlighted the importance of the sensate reconstruction of the foot sole, particularly for weightbearing (WB) areas. The treatment of large defects remained unresolved until the middle of the 19th century. In 1854, Hamilton described the cross-leg flap, introducing a new method to repair lower limb defects. Filatov, in 1917, and Gillies, in 1920, described the tubular pedicled flap, providing another possibility to avoid amputation. The advent of microsurgery in the 1970s and the description by Ponten in 1981 of myocutaneous and fasciocutaneous flaps started a new era in lower limb and foot surgery. In 1973, O'Brien (as well as Daniel and Taylor in 1975) described the first free groin flap for reconstruction of the foot. In 1978, Chang described the radial fasciocutaneous forearm flap. In 1984, Lovie described the ulnar flap and Franklin the deltoid, both of which also are suitable for the foot. Despite the great variety of flaps, the choice of the most suitable reconstruction remains debated. Foot diseases may affect normal life significantly, often requiring long care and expensive rehabilitation programs and representing a burden for society. In the 21st century, the definition of foot reconstruction must take into account tissue reconstruction, function restoration, and cosmetic rehabilitation. Can and should this foot be saved? How can the best functional and morphologic recovery be achieved? The different reconstructive options are discussed in the following sections. The final choice of the most suitable treatment always relies on the preference of the surgeon, but a correct evaluation of the clinical case must be stressed to obtain a successful result. Foot ulcers are quite common, even if frequency rates are related strictly to different etiologies. Because of the higher number of vehicle accidents, mostly involving young active people, defects of the foot sole recently have increased. Traumas to the foot and ankle account for almost 50% of all traumas affecting the lower limb. Individuals engaged in certain kinds of physical activities (eg, dancers, football players) also are involved in this high incidence rate. Tumors of the foot are rare; melanoma is the most common type, and the foot accounts for 5% of its localization. Foot defects can be classified according to etiology into 6 main categories. Traumatic etiology often is correlated to motor vehicle accidents or work accidents. (For more information, visit Medscape’s Trauma Resource Center.) Traumas or injuries may be acute or continued, mild or severe; for example, a mild continued trauma occurs in the foot of dancers. Some occupations require continued use of the foot in a poor mechanical position, thus producing pain and disability; in these patients, the trauma immediately can be repaired only with good circulation. Trauma also can be intended as a precipitating factor or a factor showing a preexisting situation. Vascular etiology may be due mostly to the artery or the vein circulation. An ischemia or a venous stasis determines a necrosis that often leads to an ulcer. The manifestations of arterial obstruction are more frequent in males and generally are represented by a dystrophy localized on the distal portion of the foot, involving the toes. Vein stasis generally is rare on the foot, and these ulcers often are localized in malleolar regions or in WB areas, starting with tissue edema and eczema. Vascular ulcers usually are painful with a higher risk of bacterial infections. Metabolic pathologies often induce neurovascular alteration to the whole body. Microangiopathy and neuropathy determine a nonpainful craterlike ulceration localized on the plantar side of the foot, especially in the WB areas. A bacterial infection by anaerobes is fairly common. The most frequent causes are diabetes, alcoholism, phacomatosis, and gout (podagra). Melanomas, epitheliomas, and sarcomas of the bone or of the soft tissues represent the most common neoplasms that can afflict this region, even if foot tumors are considered rare. Infective ulcers often are secondary to traumas, vascular deficiencies, or diabetes. All these pathologies can determine a low peripheral oxygenation and promote anaerobes, gram-negative organisms, and saprophyte infections. Congenital diseases, such as the clubfoot or the bifid spine, are rare. They are associated with deformity of the skeletal and neurologic alterations and easily may determine ulcers on WB areas of the sole. The foot skeleton represents, as a whole, a sort of arch with the medial side higher than the lateral one, limited proximally by two tubercles of the os calcis and distally by metatarsal heads, as shown below. It is the plantar bend/arch. Since the 18th century, anatomic researchers stated that the lateral arch is represented by the os calcis proximally, the cuboid bone distally, and from the last 2 metatarsi (IV and V). The medial arch, higher than the lateral, is formed by the os calcis proximally and by the astragalus distally. View of the 2 arches of the foot. The structure of the foot bones allows some vector lines to be drawn. The direction of the shafts, shown in the first image below, shows that tension planes and pressure planes share the same direction. Shafts demonstrate the 2 arches theory; these follow the direction of the arches inside the bones, shown in the second image below. During the development of human locomotion, the lateral arch acquired the task of supporting the weight in the standing position, rather than the medial arch, which is involved particularly during the walking cycle. Lateral and medial views of the vectors. Xeroradiography shows the dispositions of the shafts and the 2 arches theory. This unique weight distribution has led to the definition of a "metatarsal formula" for the weight pressure distribution. This formula shows that most of the pressure is supported by the fourth and fifth metatarsi (I less than II less than III less than IV equals V) during the erect and bipodalic station that makes a quadrilateral and thus firmly supports the area and from the first metatarsus (I greater than II equals III equals IV equals V) in the monopodalic station that forms a triangular and thus unsteady area. Recent studies on the plantar pressure distribution with a baropodometer are introducing a new theory on static and dynamic foot movements, suggesting a more important role of the heads of central metatarsal bones, thus changing the metatarsal formula (I less than II equals III equals IV greater than V). This new theory shows that the first and fifth metatarsal bones are used only to avoid lateral and/or medial falls, particularly during monopodalic station (walking cycle). According to the authors' experience, foot defects can be classified clinically with 4 parameters: extension, depth, localization, and etiology. Particular attention must be paid to the condition of the surrounding tissue and to neurovascular involvement. The foot generally is divided into 4 regions, which are the ankle, sole, dorsum, and toes. The skin of the foot, except for the sole, is similar to skin in other regions of the body. The epidermis is thin in the newborn but becomes thicker as a reaction to weight pressure. Hair and sebaceous glands are present only in the dorsum. Eccrine glands are diffused in the sole. The subcutaneous fat is poorly present in the dorsum but is very thick and granular in the sole, where it is divided by the retinacula. The retinacula are connective fibers between the dermis and the plantar fascia that build a sort of "shock absorber" for the standing position or during movements. The foot sole consists of 4 layers, which are skin, subcutaneous fat, plantar fascia, and muscles. The plantar fascia is a strong connective tissue stretched between the inner tubercle of the calcaneum and 5 metatarsal heads. Numerous septi departing from this fascia divide foot muscles into 3 compartments. Muscles for the fifth toe are in the medial compartment, for the big toe in the lateral compartment, and for all the other toes in the central compartment. Foot muscles also are divided by the skeleton into the dorsal side, with extensor brevis digitorum medial and the extensor hallucis laterally, and the plantar side, which is divided into 4 layers. The first layer, the most superficial, is composed of the abductor hallucis, abductor minimi digiti, and flexor brevis digitorum. The second layer is composed of the flexor accessorius and by the lumbricales. The third layer is composed of the flexor brevis hallucis, the flexor brevis minimi digiti, the adductor obliquus hallucis, and the adductor transversus hallucis. The fourth layer, which is the deepest, is composed of the dorsal and plantar interossei. The skeleton of the foot is composed of 26 bones surrounded by many ligaments to obtain a strong structure. These bones are divided into 3 groups. The first is the ankle, composed of 7 bones: the rearfoot (astragalus upper and calcaneum lower) and the medial foot (cuboid laterally, navicular medially and internal, middle and external cuneiform distally). The second group is the metatarsus, composed of 5 metatarsal bones. The third group is the phalanges, of which 5 are present, composed of 14 bones (3 bones for each phalangis and 2 for the first phalangis). 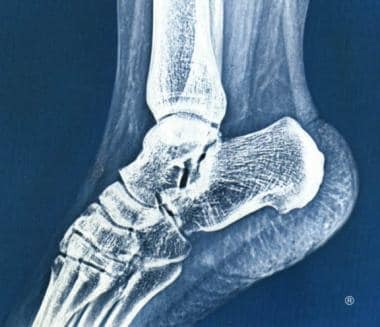 Apart from these main bones, the sesamoid bones help improve function and are often found as variants of the accessory bones. For more information about the skeletal anatomy, see Foot Bone Anatomy. The vascularization of the foot can be divided into 3 axes, the anterior tibial pedicle, the posterior tibial pedicle, and the peroneal one. The anterior tibial artery distributes to the dorsal side of the ankle, becoming the dorsalis pedis artery until the back part of the first web space, where it divides into two branches, the dorsalis hallucis and communicating. The other two branches are the tarsal artery upon the navicular bone and the metatarsal artery over the bases of metatarsal bone, where it anastomoses with the tarsal and the external plantar arteries. This vessel gives off 3 branches. The interosseus arteries receive anastomoses by the perforating branches of the plantar arch; in the cleft between the toes, it divides into 2 dorsal collateral branches from the digital arteries. The posterior tibial artery passes between the inner ankle and the heel. It divides into 2 branches: the internal plantar artery and the external plantar artery. Numerous calcaneal branches depart behind the Achilles tendon. The internal plantar artery passes forward along the inner side of the foot and the big toe. The external plantar artery passes obliquely to the base of the fifth metatarsal bone; it then turns obliquely inward to the internal between the bases of the first and second metatarsal bones, where it anastomoses with the communicating branch from the dorsalis pedis artery, thus completing the plantar arch. It gives off digital branches. The third axis, due to the peroneal artery, gives off branches to the posterior side of the ankle and calcaneum. The veins of the foot are superficial and deep. Two superficial veins are present: the internal, or long, saphenous vein and the external, or short, saphenous vein. They start from a venous arch localized in the dorsum of the foot with a convexity directed forward that receives numerous veins from the dorsum of the toes and the foot. The long saphenous vein passes in front of the inner malleolus, and the short saphenous vein ascends behind the outer malleolus. Usually 2 deep veins, called venae comitantes, accompany the arteries and their branches. The anterior tibial veins are formed by a continuation upward of the venae comites of the dorsal pedis artery. The valves of these veins are numerous. Lymphatic vessels are superficial and deep. They superficially accompany the saphenous veins, the deep anterior tibial, the posterior tibial, and the peroneal vessels. The innervation of the foot comes from the saphenous nerve (L2-L3-L4) and from the sciatic nerve (L4-L5-S1-S2-S3) with its branches (the anterior tibial nerve, the external saphenous nerve, and the musculocutaneous nerve). The anterior tibial nerve accompanies the dorsalis pedis artery, gives off a branch to the extensor brevis digitorum and extensor brevis hallucis, and gives off a cutaneous branch for the superficial area between the first and the second toes. The musculocutaneous nerve supplies the integument of the dorsum of the foot (big toe internal, second toe external, third toe). The external saphenous nerve completes the lateral cutaneous innervation of the foot. The posterior tibial nerve accompanies the homonymous artery and gives off a sensitive branch for the internal and inferior areas of the calcaneum before dividing itself into the external and internal plantar nerves. The internal plantar nerve gives off cutaneous branches for the sole and digital branches for the first, second, third, and internal one half of the fourth toe, and it gives off muscular branches for the abductor hallucis, flexor brevis digitorum, flexor brevis hallucis, and the first and second lumbricales. The external plantar nerve completes the innervation of the sole and is distributed to the little toe and lateral one half of the fourth toe. Muscular branches are for flexor brevis minimi digiti, all interosseus muscles, lumbricales, adductor obliquus hallucis, adductor transversus hallucis, abductor minimi digiti, and accessorius. The internal saphenous nerve gives off cutaneous branches for the medial side of the foot. Contraindications to medical treatment include neoplastic etiology. Contraindications to surgical treatment by local flaps or grafts include macroscopic bacterial contamination and necrosis, which require a 2-step procedure: first, clean the foot; second, reconstruct. Contraindications to surgical treatment by free flaps include severe trauma involving 2 of 3 vascular pedicles of the leg, severe vascular or dysmetabolic disease, poor general conditions, and severe smoking habit. Ring A, Kirchhoff P, Goertz O, et al. Reconstruction of Soft-Tissue Defects at the Foot and Ankle after Oncological Resection. Front Surg. 2016. 3:15. [Medline]. [Full Text]. McCraw JB. Selection of alternative local flaps in the leg and foot. Clin Plast Surg. 1979 Apr. 6(2):227-46. [Medline]. Shanahan RE, Gingrass RP. Medial plantar sensory flap for coverage of heel defects. Plast Reconstr Surg. 1979 Sep. 64(3):295-8. [Medline]. Grabb WC, Argenta LC. The lateral calcaneal artery skin flap (the lateral calcaneal artery, lesser saphenous vein, and sural nerve skin flap). Plast Reconstr Surg. 1981 Nov. 68(5):723-30. [Medline]. McCraw JB, Furlow LT Jr. The dorsalis pedis arterialized flap. A clinical study. Plast Reconstr Surg. 1975 Feb. 55(2):177-85. [Medline]. Masquelet AC, Romana MC. The medialis pedis flap: a new fasciocutaneous flap. Plast Reconstr Surg. 1990 May. 85(5):765-72. [Medline]. Baudet J, Guimberteau JC, Nascimento E. Successful clinical transfer of two free thoraco-dorsal axillary flaps. Plast Reconstr Surg. 1976 Dec. 58(6):680-8. [Medline]. Robinson DW. Microsurgical transfer of the dorsalis pedis neurovascular island flap. Br J Plast Surg. 1976 Jul. 29(3):209-13. [Medline]. Dos Santos F. L’artere scapulaire posterieure. Paris; 1980. Acland RD, Schusterman M, Godina M, et al. The saphenous neurovascular free flap. Plast Reconstr Surg. 1981 Jun. 67(6):763-74. [Medline]. Song R, Song Y, Yu Y. The upper arm free flap. Symposium on one stage reconstruction. Song R, ed. Clinics in Plastic Surgery. New York: WB Saunders; 1982. Vol 9: 27-36. Taylor GI, Miller GD, Ham FJ. The free vascularized bone graft. A clinical extension of microvascular techniques. Plast Reconstr Surg. 1975 May. 55(5):533-44. [Medline]. Taylor GI. The current status of free vascularized bone grafts. Clin Plast Surg. 1983 Jan. 10(1):185-209. [Medline]. Hidalgo DA, Shaw WW. Reconstruction of foot injuries. Clin Plast Surg. 1986 Oct. 13(4):663-80. [Medline]. Sarzaeem MM, Lemraski MM, Safdari F. Chronic Achilles tendon rupture reconstruction using a free semitendinosus tendon graft transfer. Knee Surg Sports Traumatol Arthrosc. 2011 Oct 29. [Medline]. Ahmed SK, Fung BK, Ip WY, Chow SP. Lateral tibial condyle reconstruction by pedicled vascularized fibular head graft: long-term result. Strategies Trauma Limb Reconstr. 2011 May 17. [Medline]. Gomez MM, Casal D. Reconstruction of Large Defect of Foot with Extensive Bone Loss Exclusively Using a Latissimus Dorsi Muscle Free Flap: A Potential New Indication for This Flap. J Foot Ankle Surg. 2011 Sep 23. [Medline]. Struckmann V, Hirche C, Struckmann F, et al. Free and pedicled flaps for reconstruction of the weightbearing sole of the foot: a comparative analysis of functional results. J Foot Ankle Surg. 2014 Nov-Dec. 53(6):727-34. [Medline]. Donski PK, Fogdestam I. Distally based fasciocutaneous flap from the sural region: a preliminary report. Scand J Plast Surg. 1983. 17:191. Pakiam AI. The reversed dermis flap. Br J Plast Surg. 1978 Apr. 31(2):131-5. [Medline]. Jeon BJ, Lee KT, Lim SY, et al. Plantar reconstruction with free thoracodorsal artery perforator flaps. J Plast Reconstr Aesthet Surg. 2013 Mar. 66(3):406-13. [Medline]. Hong JP, Kim EK. Sole reconstruction using anterolateral thigh perforator free flaps. Plast Reconstr Surg. 2007 Jan. 119(1):186-93. [Medline]. Yang X, Zhang G, Liu Y, Yang J, Ding M, Tang M. Vascular anatomy and clinical application of anterolateral leg perforator flaps. Plast Reconstr Surg. 2013 Apr. 131(4):534e-43e. [Medline]. Nassif TM, Vidal L, Bovet JL, et al. The parascapular flap: a new cutaneous microsurgical free flap. Plast Reconstr Surg. 1982 Apr. 69(4):591-600. [Medline]. Cho EH, Garcia RM, Pien I, et al. Vascular considerations in foot and ankle free tissue transfer: Analysis of 231 free flaps. Microsurgery. 2015 Mar 23. [Medline]. Sato T, Yana Y, Ichioka S. Free flap reconstruction for diabetic foot limb salvage. J Plast Surg Hand Surg. 2017 Feb 13. 1-6. [Medline]. Masuoka T, Nomura S, Yoshimura K, et al. Deep inferior epigastric perforator flap for foot reconstruction using an external pedicle. J Reconstr Microsurg. 2005 May. 21(4):231-4. [Medline]. Mathes SJ, Nahai F. Clinical application for muscle and musculocutaneous flaps. St Louis: Mosby; 1982. Morrison WA, Crabb DM, O'Brien BM, et al. The instep of the foot as a fasciocutaneous island and as a free flap for heel defects. Plast Reconstr Surg. 1983 Jul. 72(1):56-65. [Medline]. Nerlich AG, Zink A, Szeimies U, et al. Ancient Egyptian prosthesis of the big toe. Lancet. 2000 Dec 23-30. 356(9248):2176-9. [Medline]. O'Brien B McC, Morrison WA. Reconstructive Microsurgery. Churchill Livingstone; 1987. O'Brien BM, MacLeod AM, Hayhurst JW, et al. Successful transfer of a large island flap from the groin to the foot by microvascular anastomoses. Plast Reconstr Surg. 1973 Sep. 52(3):271-8. [Medline]. Organek AJ, Klebuc MJ, Zuker RM. Indications and outcomes of free tissue transfer to the lower extremity in children: review. J Reconstr Microsurg. 2006 Apr. 22(3):173-81. [Medline]. Radiograph illustrating the dispositions of the shafts in the ankle joint and the heel. Computerized baropodometry of the foot. Views of the different pressure levels. Nuclear magnetic resonance of the foot. This examination best shows bone, joints, and ligaments as well as the soft tissues. Nuclear magnetic resonance is important when making the diagnosis in ankle or heel diseases. Medial plantar flap, instep flap (O'Brien and Shanahan, 1979). Dorsalis pedis flap, described by McCraw and Furlow (1975). Medialis pedis flap described by Masquelet (1990). Lateral calcaneal artery skin flap, described by Grabb and Argenta (1981). Sural flap; perforator flap from peroneal artery; described by Donski and Fogdestam, 1983. Perforator flap from the peroneal artery. Dystrophic ulcer of the heel. First web space flap based on pedidial artery. Flap from the first web space (4 X 6 cm). The flap is transferred to reconstruct the posterior heel defect; reconstruction of the donor area by split-thickness skin graft. Long-term view of the donor area. Crush injury of the forefoot, plantar view. Crush injury of the forefoot, dorsal view. Injury of the foot after debridement and reconstruction by means of free latissimus dorsi muscle transfer with mesh skin graft, revascularized end to end on the posterior tibial artery and vein. Long-term result, plantar view, after repair of injury of the foot. Long-term result, dorsal view, after repair of injury of the foot. Avulsion of the foot sole, plantar view. Avulsion of the foot sole, side view. Planning of a large forearm flap. Long-term result after reconstruction with free forearm transfer revascularized side to end on the posterior tibial artery and vein. Side view after reconstruction of the sole with free forearm flap transfer, long-term result.